All humans are 99.9% identical in our DNA. It is the remaining 0.1% that makes our genetic makeup unique. That diverse 0.1% of our DNA can be used to identify people, so long as we know how to look for those differences. DNA fingerprinting is a set of techniques that analyze variable regions in our DNA in order to identify people. The “trick” scientists use to spot genetic differences is to focus on regions of our DNA that are known to typically vary from person to person. DNA fingerprinting usually focuses on specific DNA regions called “microsatellites”, which can be of different length in different people. Scientists can isolate microsatellite DNA and separate it by size using a process called gel electrophoresis. DNA fragments of different lengths form a unique pattern of bands in gel electrophoresis, or a “DNA fingerprint” that represents an individual’s unique genetic profile. DNA fingerprinting is most commonly used in paternity testing or criminal investigations. If two DNA fingerprints match, then the evidence is likely to come from the matching suspect. For example, can you tell which one of the fingerprints above seems to match evidence from the crime scene? A common form of genetic variation used for DNA fingerprinting are variable number tandem repeats (VNTRs), locations in the genome where a certain nucleotide sequence is repeated multiple times. Polymerase Chain Reaction (PCR) can be used to amplify VNTRs, in essence isolating these variable regions from the rest of the genome. This is usually followed by gel electrophoresis to separate the repetitive regions by size, which is determined by the number of repeats. Two people taken at random will usually vary in the size of their VNTRs. If the repetitive unit is really short (<12 nucleotides), these regions are referred to as short tandem repeats (STRs). Shorter repeats are even more useful for DNA fingerprinting because often the DNA being examined has degraded over time, and the shorter a DNA sequence, the easier it will be to find it intact. The repetitive unit in STRs can be as short as 2-5 bases. Given how small STRs are, scientists often carry out the electrophoresis in capillaries that can detect very small differences in the size of DNA fragments – as small as a single nucleotide! The length of a specific STR is usually referred to as a variant, or allele. Because there is a small probability that two people may randomly share the same variant for a given STR, forensic scientists have to look at several STRs (loci) scattered across the genome to accurately identify people. In the USA, the CODIS (Combined DNA Index System) database stores genetic fingerprints obtained from 13 different STR loci. Assuming at least 10 variants (alleles) at each locus, this 13-loci system allows for at least 1021 unique DNA fingerprints. This number far exceeds the total number of people in the world! STRs used in CODIS are in non-coding DNA regions, portions of the genome that do not code for proteins. Variation in these regions doesn’t have phenotypic effects, therefore mutations can accumulate more rapidly over generations, and give rise to more variability. This variability is in turn a useful tool to identify individuals. When can you take someone’s DNA sample? 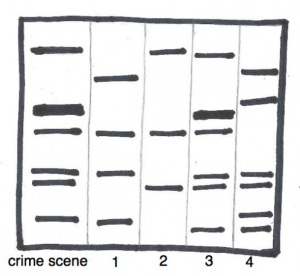 DNA fingerprinting is used in criminal investigations. DNA samples can be obtained from trace amounts of tissue left on clothes or drinking glasses, and then compared to the DNA of suspects to help figure out who may have been at the crime scene. There is an active debate around when authorities should have the legal right to obtain a DNA sample and use it in a criminal investigation. Currently in the United States DNA samples examined for a crime can only include those of official suspects and individuals who have previously been convicted of a crime. Police cannot obtain DNA samples from individuals that they interview without their knowledge. DNA fingerprinting only looks at a small number of regions in our DNA. It is possible that one day when a DNA sample is found at a crime scene, investigators will use that sample to sequence the entire genome of the sample and therefore learn about physical attributes and medical conditions of a suspect. Perhaps even predict their facial features! It may seem like science has a long way to go before DNA will be used to predict faces, but companies are already offering “phenotyping services” that predict basic features such as hair color, eye color, face morphology, and detailed ancestry, all based on a small sample of DNA. Research suggests epigenetic mechanisms are important in how cancers silence antitumor systems and activate cells for rapid growth. The FDA has already approved two drugs to treat cancer by reactivating these antitumor systems. The list of epigenetic treatments for cancer, neuropsychiatric disorders, and other ailments is currently small, but it is growing. How large the field of epigenetic medicine will become is still an open question.